As a dietitian in private practice, I have noticed something interesting happening with my clients. Many will come to me having already eliminated gluten from their diets and yet, they are frustrated because their digestive symptoms remain. In this instance, I ensure that they have been tested for celiac disease but once celiac disease has been ruled out, we discuss whether gluten intolerance or intolerance to the FODMAPS is more likely. FODMAPS stands for Fermentable Oligo-, Di-, and Mono-Saccharides And Polyols. In a nutshell, these are carbohydrates that are poorly absorbed in the digestive tract. Instead, they travel to the colon where they become fast food for the trillions of bacteria living there, increasing gas production, abdominal distention and drawing water into the bowel. Lactose is one of the FODMAPS, so if you have lactose intolerance, you can understand what I am describing. The literature base supports the diagnosis of non-celiac gluten sensitivity1 but what is tricky is that gluten-containing grains are also sources of FODMAPS. Drs Peter Gibson and Sue Shepherd from Monash University in Australia were the first to begin studying the impact of fermentable carbohydrates on those with diagnosed irritable bowel syndrome. And a recent study from a team including Dr Peter Gibson questions whether the diagnosis of gluten sensitivity is more accurately attributed to FODMAPS sensitivity2…but the jury is still out on this emerging topic. The low FODMAP diet is a learning diet – it is not intended to be a lifelong elimination the way a gluten free diet is. With the help of your practitioner, you eliminate all sources of high FODMAPS foods for at least 4-6 weeks and then begin a controlled reintroduction while monitoring your symptoms to establish your overall tolerance to these foods. The irony is that many high FODMAPS foods are deeply beneficial to overall health and digestive health in particular; however, once an imbalance has occurred to lead to such digestive distress – removing these healthy foods can be deeply therapeutic. What are some high FODMAP foods (not an exhaustive list)? 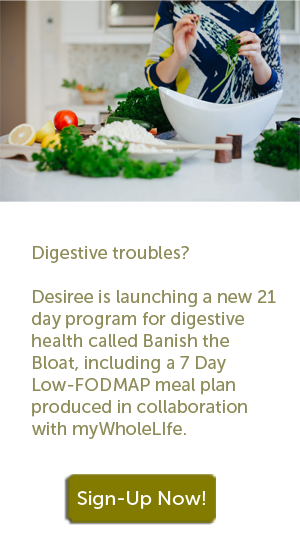 Clinical trials indicate that low FODMAPS protocols bring relief in at least 70% of those who trial them, improving gastrointestinal symptoms and elimination habits in those with IBS-D3. I find that with my clients, after two months on a low FODMAPS protocol, some choose to remain on the elimination because they feel so much better – while others may be able to completely reintroduce all sources of FODMAPS, in a moderate amount without a rebound in symptoms. So if tummy troubles are getting you down, talk to your physician to rule out any overt medical causes first. But once you are free of a diagnosis, work with one of our nutritionists to help you craft a digestion-friendly protocol that is right for you – which may or may not be FODMAP-free. Fasano, Alessio, et al. “Non-celiac Gluten Sensitivity.” Gastroenterology (2015). Biesiekierski, Jessica R., et al. “No effects of gluten in patients with self-reported non-celiac gluten sensitivity after dietary reduction of fermentable, poorly absorbed, short-chain carbohydrates.” Gastroenterology 145.2 (2013): 320-328. Halmos, Emma P., et al. “A diet low in FODMAPs reduces symptoms of irritable bowel syndrome.” Gastroenterology 146.1 (2014): 67-75.